Come celebrate my marriage to the prettiest lady in Tumbleweed, my wife Sue, at the Dust Saloon. There are almost as many tall tales about Pecos Bill in Texas as there are stars in the night sky out on the range. This little posting references the story of how he met and married Slue-Foot Sue, a tale that is also recounted as part of the Pecos Bill section of Melody Time. The 1948 animated feature was a package film with seven different sections telling seven very different stories through animation and music. Pecos Bill was the last segment on the feature and clocked in at a whopping 22 minutes. In the Disney version of events Widowmaker, Pecos Bill’s horse, isn’t at all impressed by Slue-Foot sue coming between him and his favorite cowpoke. On their wedding day Sue was determined to ride Widowmaker, steel bustle and all. After trying time and again Widomaker finally threw Sue, and that steel contraption she was wearing kept her bouncing higher and higher. Pecos attempted to lasso his bride but failed to catch her, likely due to some shenanigans from Widowmaker, and she eventually reached the moon. 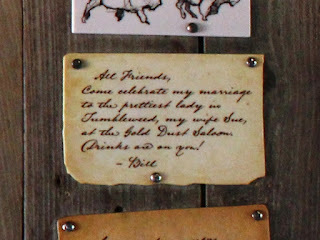 This note at Big Thunder Mountain Railroad from Pecos Bill was obviously written before the wedding day. Here’s hoping all the miners went out to pay their respects to the newlyweds, otherwise they likely missed out on an event that would become legendary in these parts!